Click here to be our friend. Click here to find Queries, Surnames, Bible Records, Deeds, Obituaries, Pensions, Wills, Census, Histories, and Databases. NOTICE All data on this website is Copyrighted by Karen Mitchell. Duplication of this data is strictly forbidden without legal written permission by the Copyright holder. Huerfano County was one of the original 17 counties in what we know of as the State of Colorado. Huerfano was formed in 1861 and encompassed all of present day Huerfano County, Las Animas, Baca, Bent, Otero, Prowers, Crowley, the west half of Kiowa, and the southern part of Pueblo counties. In 1865 the current boundary of Pueblo was established. In 1866 Las Animas was taken from Huerfano. In 1874 Bent was taken from Las Animas. In 1889 Otero and Prowers were taken from Bent. In 1889 Baca was taken from Las Animas. In 1889 Kiowa was taken from Cheyenne and Bent. In 1911 Crowley was taken from Bent and Otero. This will give you some idea of where your relatives were at different time frames. All of the records from 1861 (formation of Huerfano) to 1866 (formation of Las Animas) will be found in Huerfano. Prior to 1861 most of the records will be found in New Mexico records. Hello! My name is Karen Mitchell and I am the Huerfano County, Colorado Coordinator. I started these pages in 1996. 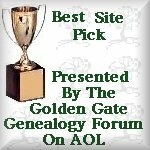 I will be posting some genealogical links pertaining to the county for you to use and enjoy. All entries on these pages are posted with the most accurate information I have, but sometimes errors creep in or new evidence comes to light so that the pages are updated. It is up to each individual researcher to verify the data they find. If you know of any other links or would like to contribute information to the page, please e-mail me. The Tri-County Obituary Project Coordinator is Louise Adams . Louise joined our team on 3-4-2003. The Tri-County Obituaries Project covers Huerfano, Las Animas and Pueblo Counties. Be sure to contact either one of us for assistance. If you prefer to be subscribed to the Digest Mode of this mailing list, send the command "subscribe" to COHUERFA-D-request@rootsweb.com to start receiving digests. BE SURE TO TURN OFF YOUR SIGNATURE FILE BEFORE MAILING YOUR REQUEST.